An interstellar pileup involving four galaxy clusters hasbecome the most crowded cluster collision ever detected. 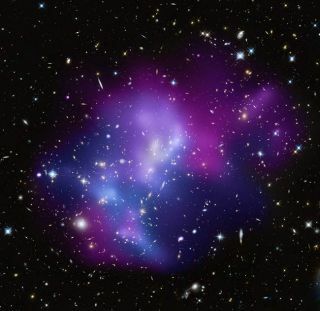 Astronomers spotted the galaxy clusters involved in a triplemerger, the first time that such a phenomenon has been recorded. NASA'sChandra X-Ray Observatory and Hubble Space Telescope joined the KeckObservatory in Hawaii to safely observe the mess from 5.4 billion light yearsaway. The cosmiccollision is taking place in MACSJ0717, a 13 million-light-year-long streamof galaxies, gas and dark matter known as a filament. That filamentary freewaycontinues to pour galaxies and other matter into a region already full ofgalaxies. "In addition to this enormous pileup, MACSJ0717 is alsoremarkable because of its temperature," said Cheng-Jiun Ma, an astronomerat the University of Hawaii. "Since each of these collisions releasesenergy in the form of heat, MACS0717 has one of the highest temperatures everseen in such a system." Collisions between galaxies can often result in largergalaxies. Our Milky Way is slated for a run-in with a colossalcloud of gas, and eventually will merge with the neighboringAndromeda galaxy. Researchers tracked the direction of the four clusters'motions to figure out that the filament was the main culprit behind the galaxycluster collisions. The hottest region in MACSJ0717 is also where the filamentintersects the colliding clusters, which pointed to the high number of impacts. Computer simulations show that the most massive galaxyclusters should grow in regions where large-scale filaments of intergalacticgas, galaxies, and dark matter intersect, and material falls inward along thefilaments. ?It?s exciting that the data we get from MACSJ0717 appear tobeautifully match the scenario depicted in the simulations,? Ma said. Optical datafrom Hubble and Keck provided information about galactic motion and densityalong the telescopes' line of sight, while Chandra's X-ray data allowed theresearchers to fully determine the 3-D motion. Ma and his team hope to use even deeper X-ray data tomeasure the temperature of gas over the full 13 million-light-year extent ofthe filament. The study is fully detailed in the March 10 issue of the journalAstrophysical Journal Letters.